What is another word for promotion? 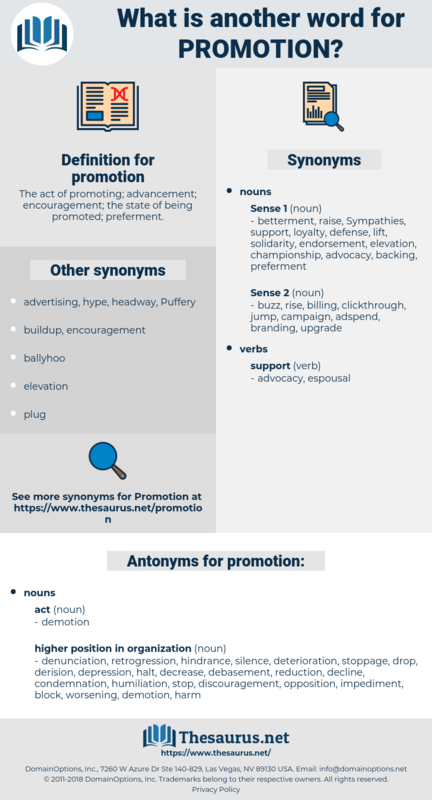 The act of promoting; advancement; encouragement; the state of being promoted; preferment. promotive, Promoting, Promoted, employment-promoting, encouraging. institutions, matters, questions, seniors, events, defenders, Promoting, Measures, issues, strategies, forces, media, needs, elders, women, Forms, Promoted, meetings, reinforcement, encouraging, PROMO, promocion, Furthering, marketing. Reinforcements, representations, champions, partnerships, fosters, contributions, priorities, Advertisements, regions, submissions, observations, interests, Missions, products, reports, ministries, benefits, advances, contracts, facilitators, projects, initiatives, announcements, departments, arrangements, Properties, practices, careers, Persons, lessons, Industries, processes, safeguards, functions, Efforts, Males, contacts, sectors, objectives, challenges, visits, catalysts, Gains, Attitudes, Resources, Countries, messages, levels, Agencies, Wars, members, Areas, artists, urges, exchanges, units, tools, plans, institutions, Promoting, Measures, issues, media, needs, women. promotive, Promoting, upliftment, attraction, impetus, pursuit, invigoration, elevation, reinforcement, provocation, encouraging, projection, propelling, reactivation, expansion, Valorization, affirmation, Furthering, Bumping, marketing, preparation. Furthered, Nurtured, accelerated, Contributed, Boosted, consolidated, intensified, Marketed, tightened, Helped, included, raised, Urged, facilitated. Empowering, accelerating, benefiting, spurring, contributing, instilling, Engendering, emphasising, Expediting, Sustaining, Cultivating, augmenting, catalyzing, Arousing, Cementing, beefing, fueling, encouraging, Furthering, Bumping, marketing. Prompted, Furthered, Bolstered, accelerated, Benefited, Spurred, stimulated, Contributed, Boosted, consolidated, Communicated, Pushed, Stepped, Aimed, Marketed, tightened, catalysed, known, pursued, included, beefed, spoken, designed, facilitated. reinforces, strengthens, boosts, markets, offers, visits. depression, opposition, hindrance, deterioration, derision, worsening, retrogression, block, decline, impediment, retreat, drop, humiliation, halt, decrease, discouragement, silence, denunciation, stop, reduction, harm, disfavor, debasement, stoppage, condemnation. dethronement, downfall, downgrade, fall, degradation, discharge, deposition, overthrow, unseating, expulsion, dismissal, abasement, ouster, removal, suspension, comedown, impeachment. Pell desperately wanted to make his promotion. His promotion had lately been rapid, and his work of extraordinary interest. pr, endorsement, advertizing, advert, pitch, sales talk, hype, ad, buildup, sales pitch, blurb, plug, public relations, advertising, sales promotion, Indorsement, ballyhoo, advertizement, hoopla, advertisement. content, substance, message, subject matter.